London, 4th April 2019 – A petition of over 96,000 signatures  was handed to the Office of Secretary of State for Business, Energy and Industrial Strategy (BEIS), Greg Clark this morning, accompanied by an Open Letter  signed by 92 organisations – and by a cardboard model of Drax Power Station’s chimney spewing CO2 into the atmosphere. The petition and letter urge him to refuse planning permission for Drax Plc’s plans  for the UK’s largest ever gas power capacity to replace its coal units slated for closure by 2025, under the Government’s coal phaseout policy. Drax admits in its planning application that the gas units would increase the power station’s CO2 emissions. As the Petition and Open Letter point out, this would take the UK further from contributing to the aim of the Paris Climate Agreement to keep global warming to within 1.5oC. The largest gas power station in the UK is West Burton Power Station, with a capacity of 1,305 MW. Drax’s new gas units would have a capacity of up to 3,600 MW. Drax’s Annual Report states that the company is seeking Capacity Market Payments for the gas units. 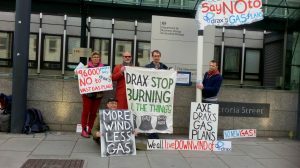 The £2 million per day subsidy figure is calculated from the figures presented by Drax in its 2017 Annual Report (drax.com/wp-content/uploads/2018/03/Drax-Group-plc-2017-annual-report.pdf) and was confirmed by Drax in an email to Biofuelwatch.